I went to bed early last night, so it wasn't until this morning that I woke up to the horrific news from Manchester Arena. There are no words are there? There are no words that will do anything to ease the pain for those families, the ones with missing children, the ones who are coming to terms with losing a loved one. Nothing anyone can say will make it any better for any of them. Not even the ones that maybe weren't hurt, the 'lucky ones'. Those people, most of them very young, will carry the memories, the emotional scars of what happened, probably forever. And for what? What can it possibly achieve? I just don't get it. I don't understand the point of it at all. Terrorism has been around for as long as I can remember. When I was little, there were constant threats from the IRA, and, since then, there have been countless attacks, causing chaos and destruction all over the world, in the name of various terrorist groups. Yet, still, every nation in the world, picks itself up, dusts itself off and carries on every single time. Over time, the memory of the beautiful souls who were innocently caught up in the tragic events live on, and the identities of the perpetrators and their 'cause' or whatever you want to call it, fade into nothingness. So it achieves nothing, except to pointlessly destroy lives. I will never understand how any human life can be worth sacrificing for any reason, but innocent lives, particularly young, innocent lives, who did nothing to anyone? It makes no sense. It achieves nothing. I've never been to Manchester, but I know Mancunians, and I know something about the city. This is a city that thrives on life and vibrancy and joy. It's a city famous for its strong industrial heritage, its work ethic. It's well known for its music and club scene, its a city full of energy and drive. Manchester will not be broken by this. We've already seen the people of Manchester coming together to support each other on social media. The city will grieve, and it will rally to support those that need it, but the only lasting affect will be a renewed sense of strength and community spirit. It's horrible feeling powerless to do anything to help the victims of this devasting situation. 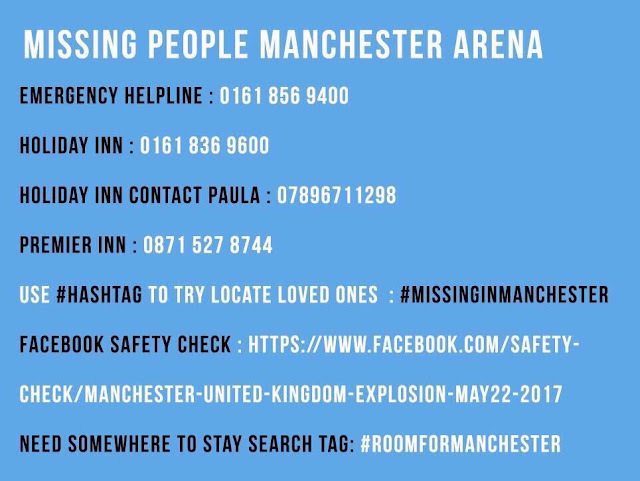 I will carry on retweeting any relevant posts, particularly the ones offering information and those featuring people who are still missing. However, it is also very important to be aware of fake news. Unbelievable as it sounds, there have been reports of people using this incident to gain retweets and attention for themselves by making fake missing person appeals and other untrue reports. I don't want them to get any attention and it also doesn't help the genuine efforts to find people, so please check the source, if you are sharing anything. 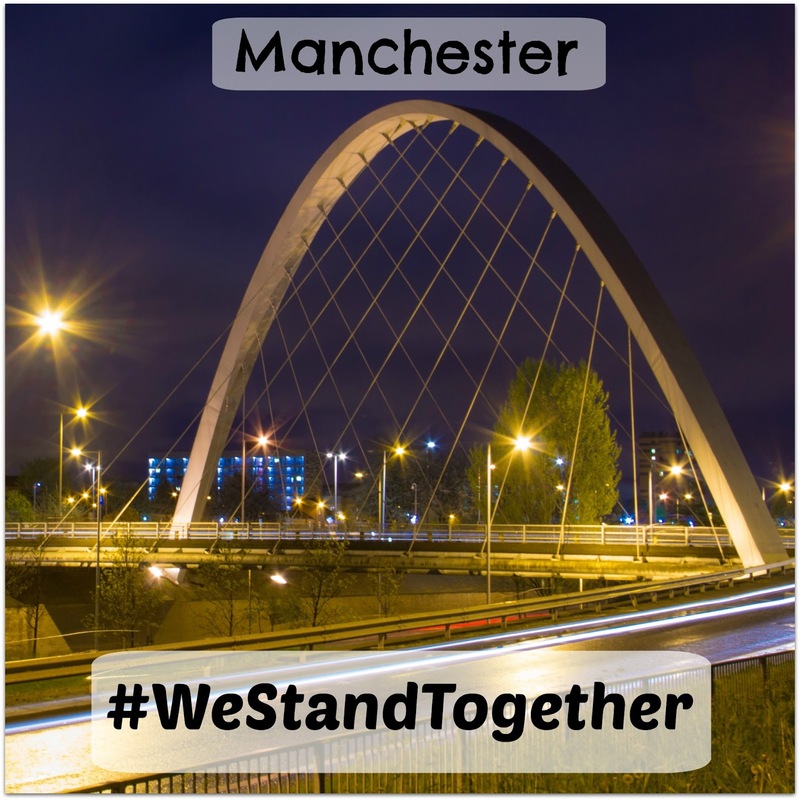 I will also be using the hashtag #WeStandTogether in the hopes that the strength of support being demonstrated through social media might offer a crumb of comfort to those involved. This infographic offers details of numbers people can call and relevant hashtags to use to get help if needed. If you don't know how to save it and share it to social media, you can find it pinned at the top of my Twitter Feed if you want to retweet it. I still can not believe the atrocity that took place to these innocent people. How can someone be so cruel. I try to tell my children about all the good things while not hiding the bad. There are some wonderful tales of bravery in the midst of the horror. 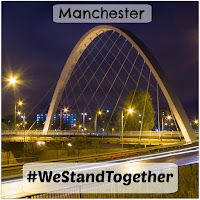 #WeStandTogether, always. It's such a shocking thing to happen. It can't believe they actually targeted a place they new would be full of lots of children. This one really really did effect me, it was such a terrible act. I have just seen how much money has been donated too, it will give a little bit of help to those affected. This Morning LIVE is Coming to Birmingham in May!